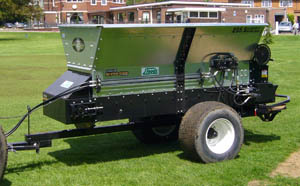 Pequea Turf Superspread units are uniquely designed to evenly spread a wide variety of materials from fine sands to compost. Built to last construction and a choice of four different distribution systems make the Superspread both a very versatile and dependable peice of equipment. From the NFL to the PGA, the Superspread continues to be the topdresser of choice for industry professionals.